Product prices and availability are accurate as of 2019-04-18 16:54:40 UTC and are subject to change. Any price and availability information displayed on http://www.amazon.com/ at the time of purchase will apply to the purchase of this product. Color Theme: Beige FlameCollection: Tiffany Animals NouveauScarlet dragonflies with glowing jeweled eyes and filigree topped amber wings dive over a bone beige background dappled with scarlet clear and amber jewels. 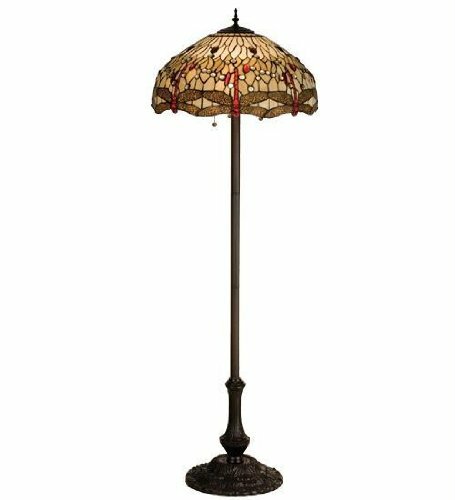 This floor lamp is finished in a warm hand applied mahogany bronze. Please note actual weight is 39.00 lb(s). This product is ships over sized class.